It was an ordinary design meeting, when designer David Martin presented a prototype of a sconce he was working on. 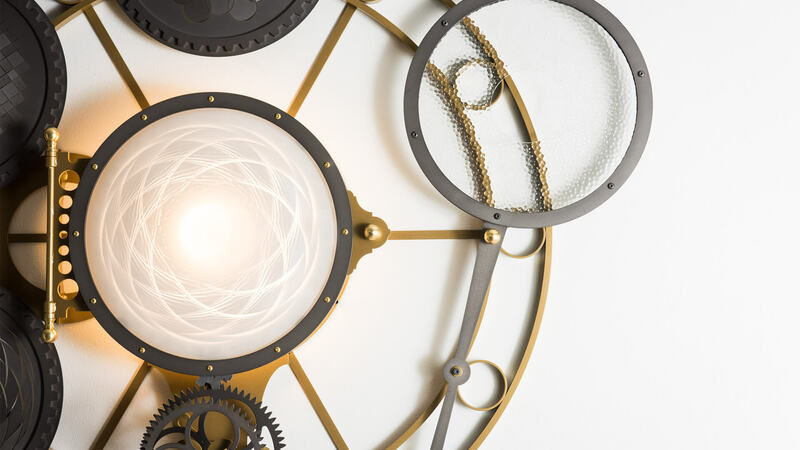 It was a round sconce, about a foot in diameter that featured a perforated plate of steel backlit by an LED. We started to give David some lukewarm feedback when he said “but check out what happens when I rotate the steel plate…wish we could do this.” David manually turned the perforated plate and the piece came alive as the light danced and twinkled through the cutout pattern of the disc. Half-jokingly we asked David “why can’t we do that?” but we knew the answer: too complicated, too costly and too unconventional (“it wouldn’t sell”). Three things I found myself saying more often than I like or should. I realized at that point why Art + Alchemy was created. None of these reasons should ever prevent a concept from being born. I was determined to help David make this little sconce turn, even if it happens in the most complicated, costly and unconventional way imaginable. 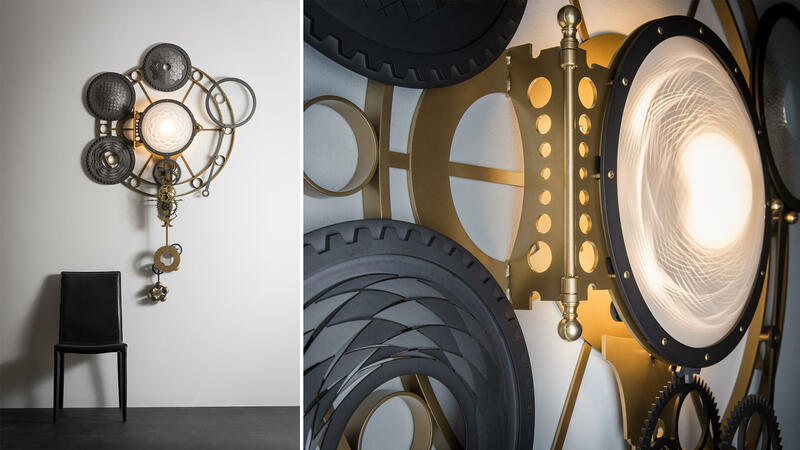 That little sconce resulted in Hugo, a four feet wide by six feet tall clockwork of steel and brass, gears and glass, weights and counterweights, and it even has a real swinging pendulum. It took us almost a year, and nearly brought us to our knees. Does it run like clockwork? Not even close. But it does run, even up to thirty minutes at a time and then, is manually rewound to run again. Our Sales department has found it challenging to make sense of it all: What do you mean it’s quirky? Does it tell time? It has to be manually reset? No showroom will want to deal with that. Why couldn’t you just use an electric motor? What is it exactly? What is it exactly? That is a good question. 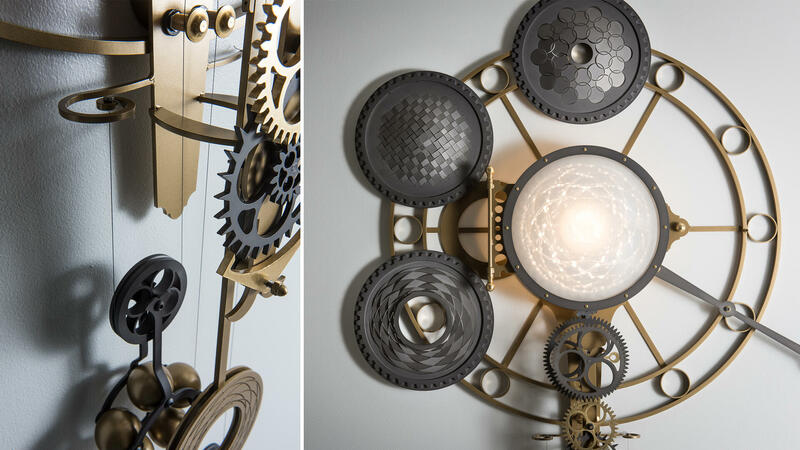 David Martin would say that Hugo is more of a deconstructed kaleidoscope than a sconce or a clock. For me, it doesn’t even need to be running to appreciate its beauty. 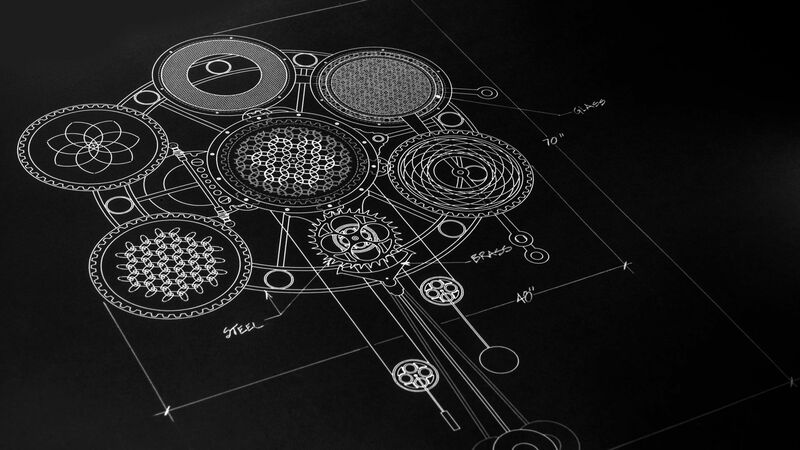 In Hugo, I see the unorthodox design genius of David Martin, the most indefatigable designer I have ever met. I see the untapped potential of its engineer Lynn Gardner, even though she had a million other “real” lighting projects on her plate at the same time, and probably wanted to strangle either David or myself. And I see the quality, pride and patience in the work done by our craftsman Ed Chisamore who must have thought we had lost our minds in the process, but trusted us enough to never complain. So I’m fine if we never sell a single Hugo. It deserves a complicated and unconventional owner, and it will definitely be costly. Qualified applicants only, need apply.